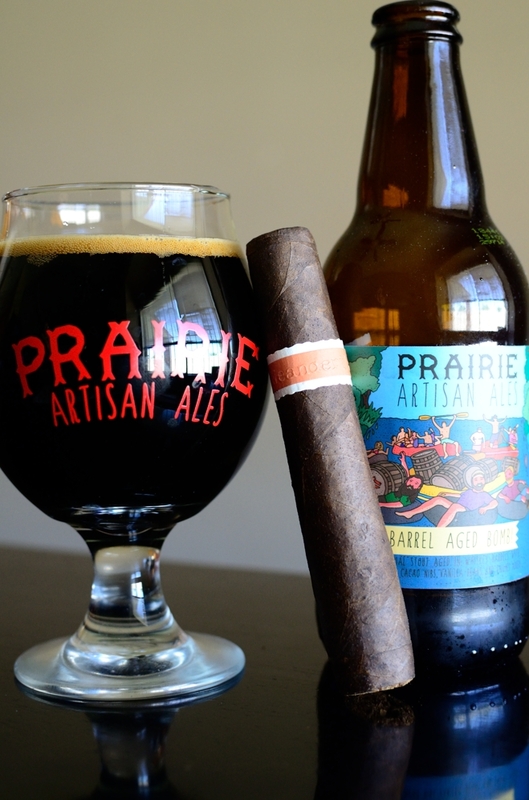 Staying on task again I decided to head out back with a RoMa Craft Tobac Neanderthal and a bottle of Prairie Artisan Ales’ Barrel Aged Prairie Bomb! RoMa Craft Tobac co-founder Skip Martin discussed details of this cigar on the 4/18/14 edition of Stogie Geeks. As Martin was becoming more experienced with the blending process, he discovered that increasing the strength of the blend through adding ligero is something that really did work. At the same time, Martin learned that different tobaccos have different nicotine levels. He was introduced to a Pennsylvania Double Ligero leaf known as Green River Valley Sucker One (GR-S1). This is a regrowth leaf from Pennsylvania broadleaf that has a natural higher nicotine level (between 9% to 13% – significant higher than the 5% – 6% found in Esteli, Ligero). Using this leaf allowed Martin to increase the blend’s strength. Various filler tobaccos were then added to balance out the flavor and aroma. 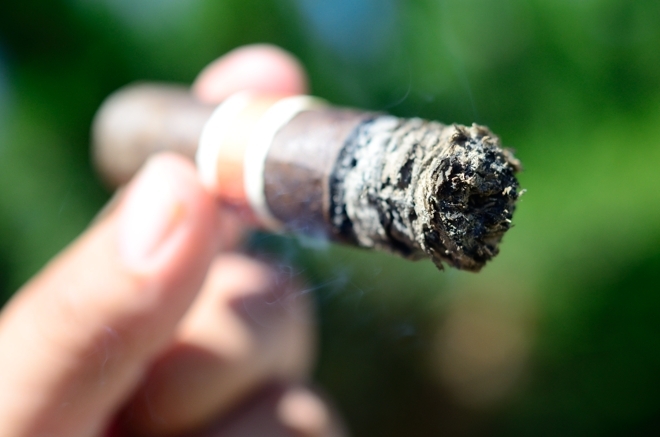 The blend consists of the Pennsylvania Double Ligero mentioned above, Nicaraguan leaf from the Condega, Jalapa, Pueblo Nuevo, and Esteli regions as well as some Dominican Republic tobacco for the fillers along with a U.S. Connecticut Broadleaf Maduro Binder, and a Mexican San Andreas Maduro Wrapper. 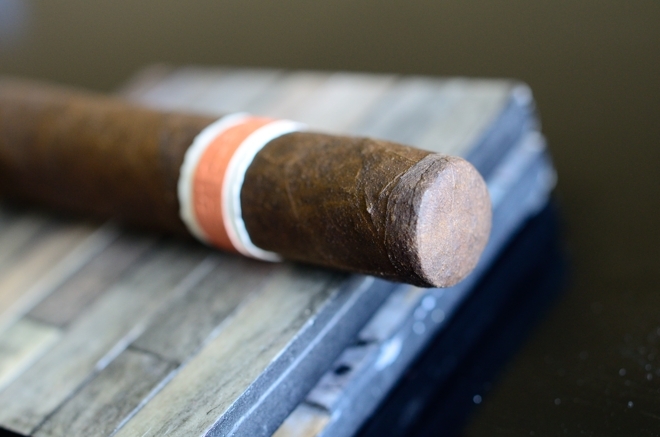 The RoMa Craft Tobac Neanderthal is available in a single, complicated to manufacture, full-production format called the “HN” which stands for “Homo Neanderthalensis”. The HN is a 5 x 52/58 figurado with a completely flat cap. 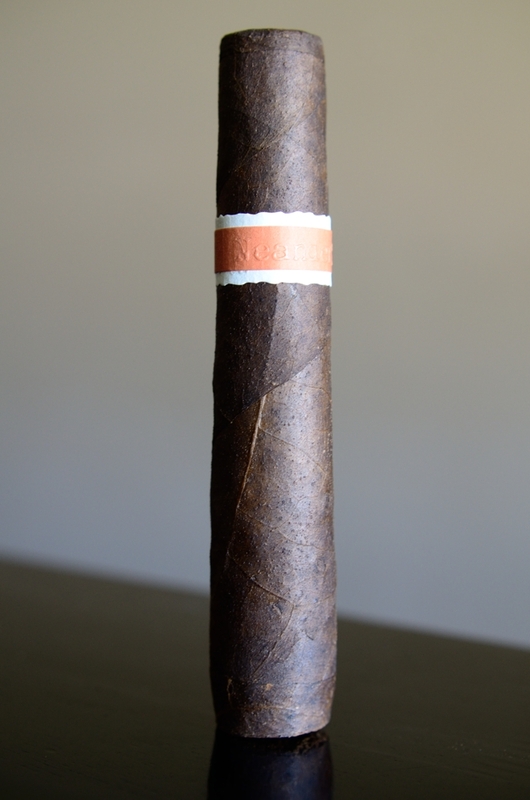 Along with the standard format, the RoMa Craft Neanderthal is also offered in a 4 1/2 x 52 vitola called the “SGP” or “Shallow Gene Pool” which is a store exclusive limited to Serious Cigars in Houston and Riverside Cigar Lounge in Indiana which will also be available as an event exclusive. While I don’t know exactly what the packaging and prices on the SGP will be, the HN comes packaged in boxes of 50 and runs $12 a stick. I picked mine up at Cigar Hustler who quickly shipped them out to me, and still has them in stock. As I stated above, the RoMa Craft Tobac Neanderthal is far from a traditional format. 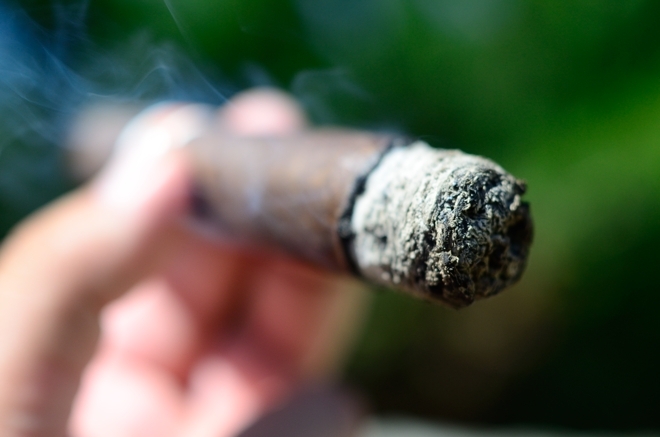 The cigar starts with a completely dead-flat cap and a 52 ring gauge which widens out to 58 towards the foot of the cigar before quickly tapering back in a bit just before the foot. 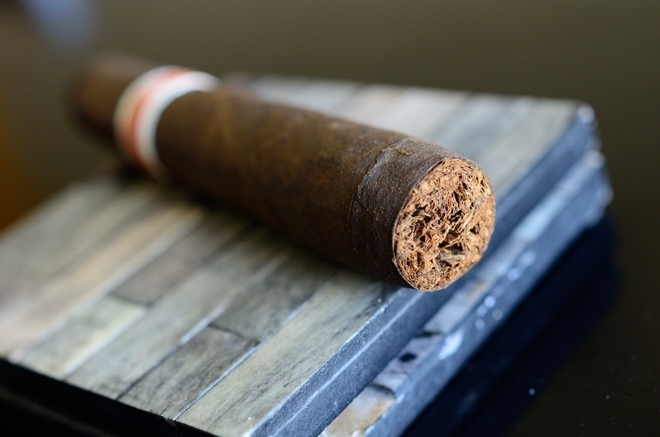 The wrapper on the RoMa Craft Tobac Neanderthal is a beautiful, consistent, dark brown with a few darker areas around the foot of the cigar, and running parallel to the larger vein that runs the course of the cigar’s body. The texture is a slightly oily and very beady with a lot of rough tooth while the wrapper itself feels extremely dense and thick. Hell, the whole cigar feels so heavy I could probably knock someone out with it if I hit them over the head with it. That being said, there aren’t any soft spots whatsoever as the bell of the cigar leads up to the flat cap. The boxes of these cigars actually come with a razor blade to aid in the clipping of the cap. 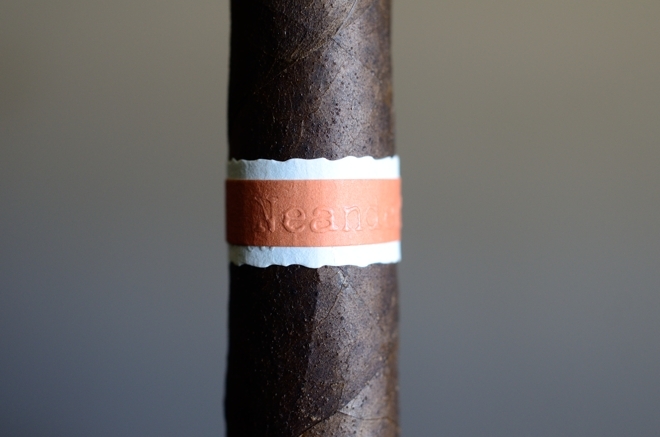 The RoMa Craft Neanderthal is polished off with the beautiful letter-pressed bands I absolutely love. 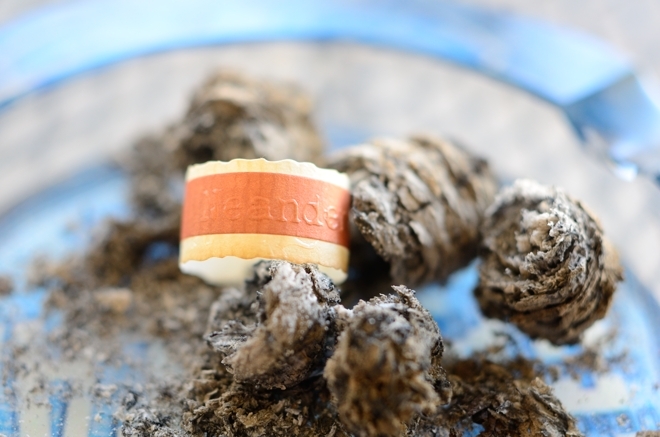 This one is a light tan and features the word “neanderthal” embossed in the front and a small RoMa Craft Tobac crest in white on the back. The wrapper on the RoMa Craft Tobac Neanderthal gives of some nice oaky aromas while the foot of the cigar is much more natural with some damp tobacco and pepper scents. The cap was a bit difficult to line up properly using my double bladed Palio cutter. If I had a razor blade similar to those that came in the box that would have been my weapon of choice, but I made do and after a bit of precision work I cut just a tiny sliver off the cap, exposing the filler tobacco. Skip’s a one man army trying to teach people how to properly cut cigars. The cold draw produces a really meaty mixture of plum, oak and spice with some natural tobacco mixed in. The RoMa Craft Tobac Neanderthal starts out with a bang leading me in with some bold cayenne pepper, strong oak, plum, pecan and spice. The pepper was so strong it would leave my lips and tongue tingling for a few seconds after every round of draws. It took about a quarter inch for the pepper to fade out and as it did more and more of that oaky goodness came out. Despite the cigar being packed with tobacco the draw was absolutely perfect. Each tiny puff kicked out massive clouds of thick, white smoke. The cigar let loose a good amount of stationary smoke as well as the cigar rested in my ashtray. The burn line had one good sized wave but it started to correct itself as I neared the end of the first third. The ash left behind was tightly compacted, dark and medium gray, and held on for about an inch and a quarter before falling into my ashtray. The RoMa Craft Tobac Neanderthal continues to impress with the sheer amount of flavors being pumped out. The oak is still leading the way with some dark chocolate, coffee, pecan, spice, plum, and some slight char and sweetness. It’s got some bite too as I started to feel the nicotine about halfway in. The retrohale is way sharp coating my nasal passage with a bit too much cayenne pepper backed by some of the oak I pick up on the standard draw. As I suspected the burn line has fixed itself and is now burning razor thin, and perfectly even. Again, the flavors are killing it into the final third of the RoMa Craft Tobac Neanderthal. The oak is still taking center stage back by lots of spice, chocolate, and coffee. There is still some slight spice and sweetness mixed in as well. After that wave in the first third, the cigar has burned perfectly and razor thin without any extra help from my torch. Usually, stronger cigars tend to build up a good amount of harshness towards the end of the smoke, but after the 2 hours it took to take this bad boy down to the nub it was clean and smooth, still boasting a ton of flavor and a great deal of strength. I walked away from this cigar with a nice nicotine kick. Skip has just added to an already stacked arsenal. Out of the gate I expected the RoMa Craft cigars to have a bit more bite than they had when they first launched (mostly due to Skip’s love for full-bodied, full-strength cigars), but was surprised with the more mild approach. 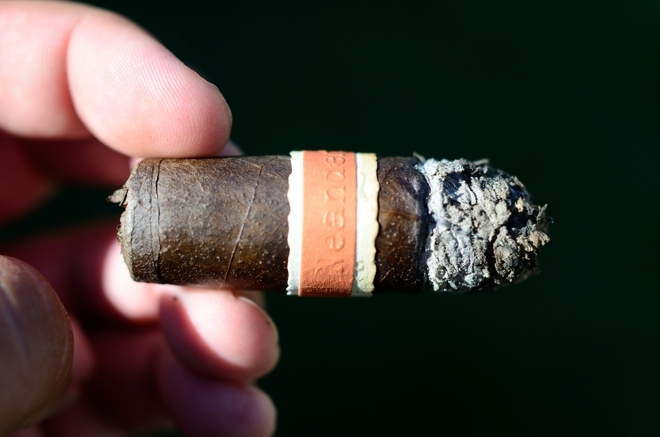 It’s not a bad thing by any means as I’ve been a huge fan of each of the past sticks in their portfolio, but they delivered a powerhouse cigar with great balance, and bold flavors with the Neanderthal. This cigar comes out of the gate firing on all cylinders and doesn’t give up until your fingertips are burning. At $12 a pop it’s not the most affordable cigar out there, but it’s more than justified and very box worthy. Being that the Neanderthal is a full-production line I can see it having a permanent place in my regular rotation for a very long time. The Aquitaine has been my favorite RoMa Craft Tobac stick for a very long time, but it now has some competition. Now if we could just get them in a shop here locally, that would be great. A little nod here to Skip and his love for Prairie Artisan’s stouts. The first time I smoked a Neanderthal I knew I wanted to pair with something that would really match up to the bold oak I encountered throughout the cigar. There was little doubt in my mind that the Barrel Aged Bomb! from Prairie Artisan Ales would be the perfect pair. Brewed at the Prairie Artisan Brewery in Oklahoma this 11.2% ABV imperial Stout is aged in Balcones Distilling whiskey barrels with coffee, cacao, and vanilla beans and chilies added. The Barrel Aged Bomb! starts out with lots of sweetness, vanilla, chocolate, and malt with a very heavy mouthfeel before finishing with more sweet milk, chocolate, a bit of booze, spice and a nice bourbon aftertaste. What more can I really say, it was a match made in heaven. I think the RoMa Craft Tobac Neanderthal would also pair wonderfully with just about any big stout, a Belgian quad, or a few fingers of bourbon. My shop got these in last Friday and I picked a few up…people are saying this cigar need some time to rest as I keep hearing…I noticed when I pulled the cigar out of the cello (last Friday it was very heavy and the filler almost felt wet)…your review gives me hope that I wont be smoking this cigar too early when I light it up this weekend, although I have been dry boxing it for 2 days now. Great review, got me excited! Maybe I got lucky but the few that I smoked last week had no wet/burn issues at all. Smoked great all the way through. Let me know what you think when you fire it up!